Today, I had the great pleasure of speaking to Emergency Department professionals at the WEDOC 2014 conference. I think the most exceptional health professional conferences are the ones that include a direct patient voice in their speaker lineup. Emergency department staff and physicians are an important audience to me. Aaron has taken us to ED on several occasions. I am grateful for the triage nurse who listens to my gut feeling when I say, ‘he is really really sick,’ and to the doctor who talks to Aaron directly and uses his name. I am thankful for all those warm blankets brought to both of us in the middle of the night; for that reclining chair so I can doze; for the resident who shares her reasoning behind his treatment; and for the attending physician who explains the rationale for the long wait for his admission upstairs. 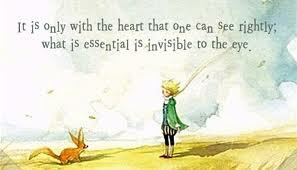 Today I spoke about all that small stuff – the things that are invisible to the eye, as the Little Prince says above. I suggested that QA and QI and Lean programs are counting the wrong things – for patients are not cars in Toyota factories. We are human beings, not statistics. How I wish what was valued and counted in the hospital were acts of kindness and demonstrations of compassion. For it doesn’t matter to me whether it is a Health Care Aide or a Hematologist sitting on the bed, holding my hand. All that matters is that someone from the hospital has taken the time to demonstrate that they care. I was grateful for my warm and receptive audience, who applauded enthusiastically, asked respectful questions, and chatted with me afterwards at the break. It struck me in those conversations that the problem of hospital ED overcrowding may not go away anytime soon, but it is very important how patients and families are treated during their time in the ED. I know that models of care, new buildings, innovative programs and services are important, but if the quality of the one-on-one interactions is not there, none of that matters. Patient and family reps – let’s all commit to continue to embrace opportunities to speak up and share our perspectives. If one person walks away thinking a bit differently, or understanding our perspective better…well, then that’s a job well done.